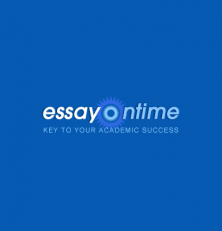 Essayontime.com is a new source for ordering academic works online. There was almost none reviews about this platform, so our team decided to examine this company to highlight both positive sides and vulnerabilities. We analyzed deeply all of the important features and services, provided by this company. The summary of this research is provided below. Essayontime.com provides moderate prices for their works. The tariffs are slightly higher, than average, but still reasonable. The price of your work depends on many factors. One of such factors is the quality level, which you can select by yourself. There are standard, premium and platinum quality levels. If you need the best paper from the most experienced and professional essay writers, your choice is “Platinum”. On average, “Platinum” is approximately 15% more expensive, than “Standard”. Also, such factors, as size and deadlines also influence the price of your work. For example: if you order essay on criminology, 15 pages long and with 10 days deadline, Standard quality paper will cost you 313.36$, Premium quality paper will be worth 341$, and Platinum quality paper is going to be 384.61$. Price is calculated automatically after you fill in the necessary information about your order. Customer Support at essayontime.com is available 24/7. You can contact with them through the chat. After you have written your question, you have to wait for some time until one of agents responds to you. It can take from 4 to 15 minutes. They are ready to assist you in resolution of problems regarding your order. The quality of papers depends on the level of quality, that you select in the very beginning of placing your order. If you choose “Platinum” quality level, your work will be made by a person with corresponding academic degree and more than 5 years of essay writing experience, the paper will be double-checked for plagiarism and your order will have a high priority status. If we select “Premium”, we receive almost the same, except for the experience of a writer – it can be less than 5 years, or even less than a year. In “Standard” option we receive a work with a low level of plagiarism and from a writer who possess an academic degree. The work will not have a priority status or an advanced plagiarism check. It is very important to mention, that title page, bibliography page and services of revision and specific formatting (MLA, APA etc.) are free in all three variants. Also, if you want to be sure, that the work will be performed in the way you want it, you may look through samples, provided on the website. Just click on the “Samples” link on the top of the webpage and find everything you need. Any company of such type sure has some special offers or loyalty programs. It is obvious, because clients are more likely to select company with a discount offer rather than without it. Discount program at essayontime.com is simple – you have 5% discount if you have ordered more than 15 pages of works (Bronze membership), 10% discount if you have ordered a combined total of 51 or more pages (Silver Membership), 15% discount if you have ordered 101 or more pages from the company (Golden Membership). In the other words: the more papers you order, the more discount you have. Simple and nice special offer for future regular clients. The website is designed simply, though the combination of colors hurts your eyes a little. All necessary information is situated on the top and on the left side of the homepage: you can just click on the link that you are interested in and wait until data is being downloaded. On the order page you can mention everything regarding your future essay, tick the services that you need (plagiarism report, VIP support, proofread by the editor, VIP Service package etc. ), write your contact information and finish your order. Everything regarding your order is on the one page, and this makes your purchasing process really comfortable. 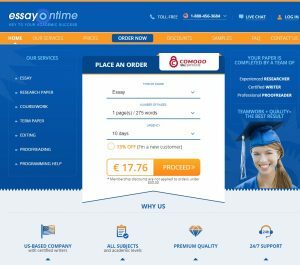 Our investigation shows, that essayontime.com is a good service for ordering any types of academic works. Prices are adjustable due to your funds or needs – you can select Standard, Premium or Platinum quality levels. Also, a simple system of discounts is provided. Works written by their writers are of a positive quality and usually correspond to their price. The website is raw, yet informative – almost every issue is covered in the info provided. If you have some specific questions, you can contact customer support to resolve them in the nearest possible time.